Herbicides are poisons and should be handled with the greatest respect. They can be absorbed very easily through the skin, by breathing the vapours, and by ingestion (eating or drinking). By law, herbicides must be used strictly in accordance with their manufacturers’ labels and material safety data sheet (MSDS), according to National Registration Authority permits. They should be kept well out of the reach of children, preferably secured in a locked cabinet. They should always be stored in their original labelled containers. Read the label before opening the container and follow the instructions exactly. Wear protective clothing: long sleeves, long pants, sturdy shoes, gloves, eye protection. Always wear waterproof gloves. A respirator is advised when mixing or pouring the liquid. Do not eat, drink or smoke while using herbicide. Wash skin and equipment afterwards. Wash contaminated clothing separately. Clean up any spills on your skin with soap and cold water. For larger spills follow the MSDS and use a spill kit and dispose of contaminated material safely. Triclopyr, which often sold as Tree, Blackberry and Woody Weed Killer. Glyphosate is a systemic, non-selective herbicide. It inhibits the action of an enzyme, preventing the production of an amino acid essential to plant life and growth. It must be applied to green leaves, or directly to a plant’s sapwood, which lies under the bark. Triclopyr is a selective systemic herbicide for woody and broadleaf plants. It is a growth inhibitor which moves to a plant’s roots, stops growth, and eventually leads to the death of the plant. Triclopyr can be applied to green leaves and to bark. Some chemicals which are added to herbicides are not safe to use near waterways as they have the potential to seriously affect the quality of aquatic ecosystems. This information can be found on a Material Safety Data Sheet (MSDS). If you need to remove weeds, particularly trees, within 20 metres of any kind of watercourse, even a drain that runs only when it is raining, you must seek advice and assistance from Council’s Environmental Management Section: phone 4780 5000. This also applies to the removal of trees from very steep land. See Erosion Alert. Apply herbicide when the plant is actively growing (for many, the best time is from summer to autumn). Do not apply herbicide when the plant is under stress: extreme heat or cold, drought, waterlogging, or disease. When spraying choose early morning or late afternoon in summer; midday in winter. Do not spray when wet or windy weather is anticipated. Treat deciduous plants in late spring or in summer, when in full leaf. Treat flowering plants before they set seed. Where possible, stage weed removal. Large areas of exposed soil can promote weed invasion and may result in soil erosion, carrying weed seed into the bush. Mulch bare soil, and stabilise it by planting bush-friendly plants (see Mountain Landscapes). Suitable for small to medium sized woody weeds up to 10 cm in diameter (or larger shrubs if using a chain saw). Tools for the job: loppers, bush saw, herbicide applicator, impervious gloves. Refer to the Safety Precautions above. Clear the ground around the base of the plant. Cut the stem as close to the ground as possible, using secateurs, loppers or a bush saw. Make sure there is no soil on the cut surface. Make cuts horizontal to prevent the herbicide running off the stump. Sharp angled cuts can be a hazard. Apply undiluted herbicide to the cut stem immediately after cutting – within 20–30 seconds – before the plant cells close and the translocation of the herbicide ceases. Ensure there is no runoff of poison. Use the least amount of herbicide possible. If cutting at the base is impractical, cut higher to get rid of the bulk of the plant, then cut again at the base and apply herbicide. 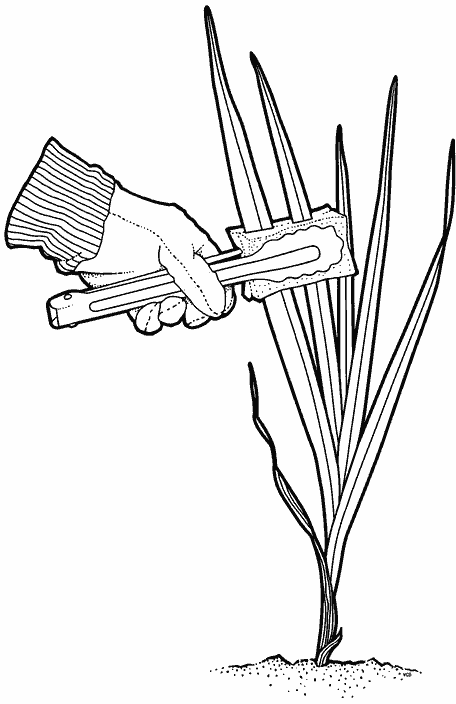 If plants resprout, scrape the stems (see below) or reapply the cut and paint method. This method is suitable for vines and scramblers with woody stems. 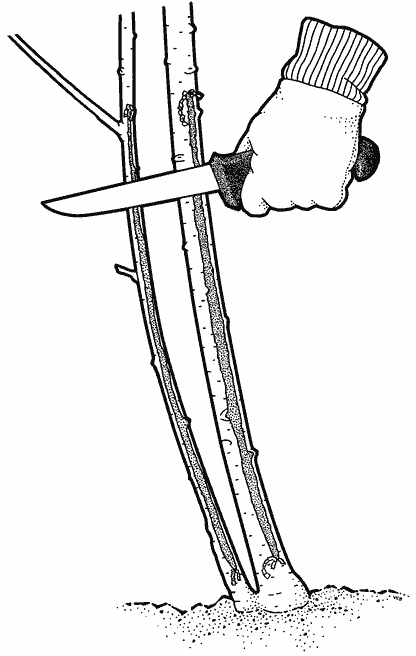 Using a knife, and starting from the base, scrape 20–100 cm of the stem to expose the sapwood, just below the bark. Within 20–30 seconds, apply undiluted herbicide to the scraped area. Try to scrape all the main stems. Do not ringbark the stem: scrape only one third of the diameter or less. Stems larger than 1 cm in diameter can be scraped on both sides. Vine curtains can be cut at chest level, then again at about 30 cm. Scrape or cut and paint these lower stems, or spray new growth. Pulling vines (especially twiners) out of trees and shrubs may do a lot of damage. They are best left hanging to die. Vines such as English Ivy, which cling to bark, should also be left to die on the tree. The loss of bark resulting from pulling them down may cause serious harm. This method is suitable for herbaceous plants with bulbs, tubers or corms (See Montbretia fact sheet). Bushcare has produced an instruction page to make your own wiper. Download a PDF with instructions on making and using the wiper. Remove and bag any seed or fruit. Using a weed wiper, start at the base and wipe all the stems and/or leaves with a dilute mix of herbicide. For more information see Using_Your_Wiper. If leaves have soil on them, wipers must be regularly washed. Take great care when wiping: do not allow the herbicide to touch your skin or to run off into the soil, or to get on a non-target plant. Wear safety glasses to avoid being splashed. 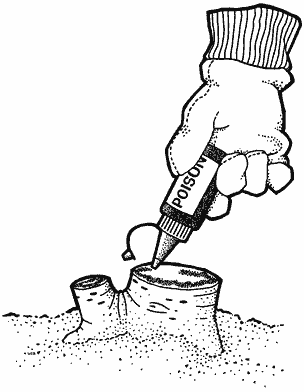 Stem injection and Frilling or Chipping are methods for treating shrubs or trees greater than 10 cm in diameter at the base. Use a cordless drill (9 mm bit), a hammer and chisel, or brace and bit. Below any branches, drill or chisel holes round the base of the tree, into the sapwood, angled down at 45°, and at 5 cm intervals. Make the holes about 4 cm deep. Within a few seconds of drilling each hole, fill it with undiluted herbicide. Do not ringbark the plant. Use this method only when falling branches (as the tree dies) will not be a safety hazard. 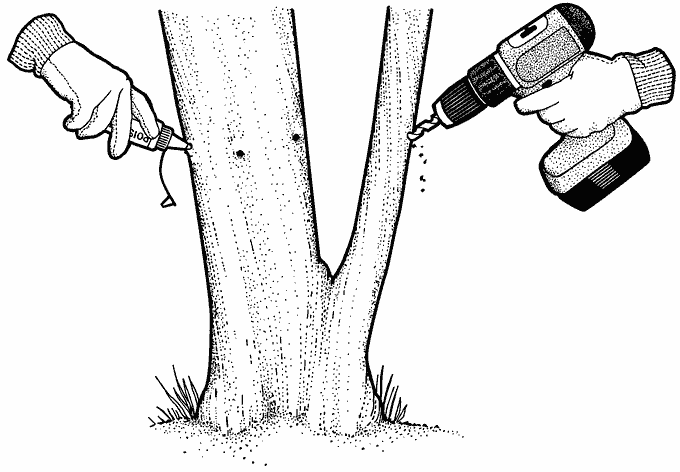 If a drill is not available, use a sharp chisel or axe and make a deep cut at 45° into the sapwood. Fill with undiluted herbicide immediately. Repeat these cuts around the base of the tree at 5 cm intervals. See When to Treat with Herbicide. This site does not set out to give a thorough treatment of the subject of spraying. Consider all other options for weed control first. First read above about using herbicides, safety precautions, the conditions of use, when to treat with herbicide, and the cut and paint technique. See also Erosion Alert. Spray at the correct stage of a plant’s growth, at the right time of day, and when there is no wind. See When to Treat with Herbicide. Spray at low volume, using the minimum amount of herbicide. Spray low: it is often best to cut a weed down to near ground level, then spray the regrowth. Avoid off-target damage from spray drifting on to desirable plants. Do not spray near watercourses. Keep children and pets away from the sprayed area until the next day.